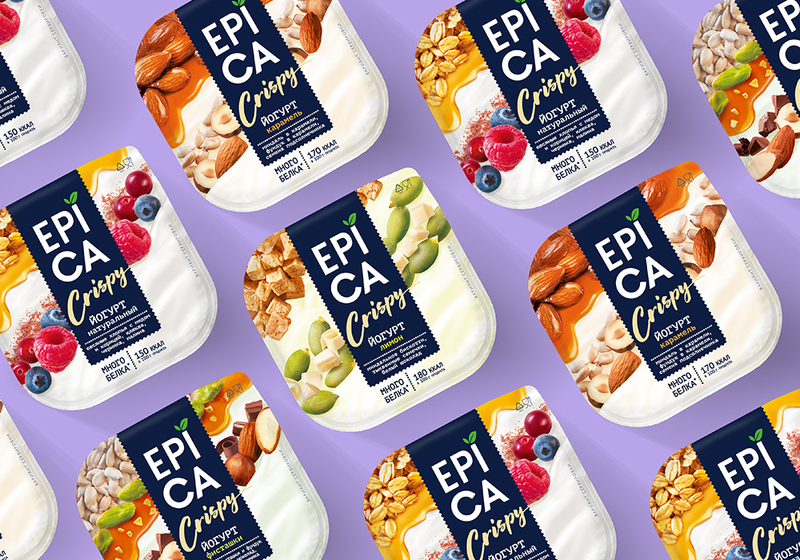 Supporting the trend for functional products and the image of Epica as a trendsetter of flavors in the category, Ehrmann added a flip-yoghurt with crunch to the Epica line. We were commissioned to create a design and naming of the sub-lines for the fashion novelty. Crunchy granola - the perfect breakfast and a storehouse of vitamins! 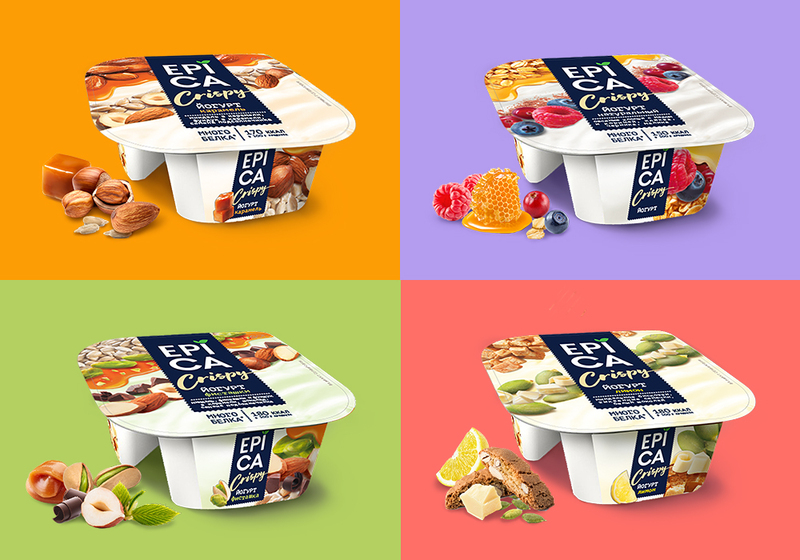 A rich, high protein yogurt is a great addition. 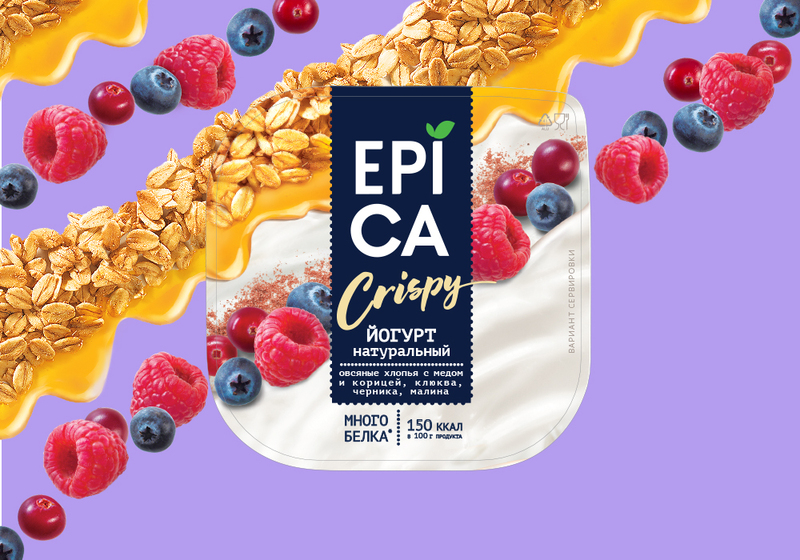 This common good habit gave the idea to create a 2 in 1 product under the brand Epica, which is not yet presented on the Russian market - flip-yoghurt with a crunch. 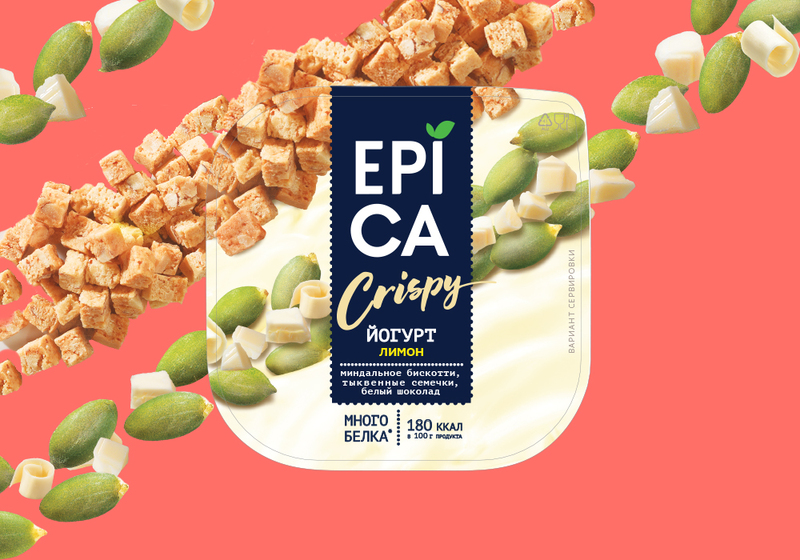 We had to preserve the continuity and recognition of the Epica brand, focusing on the crisp component and its functionality. The separation of the filling and yogurt into two separate compartments allows you to keep a pleasant crunch. 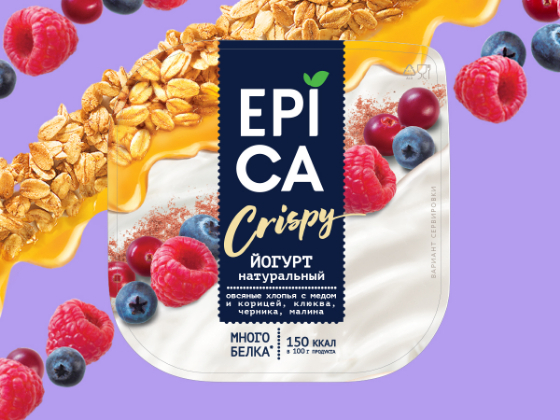 It is this feature of the product that is emphasized in naming: “crispy” perfectly conveys the organoleptics of baked granola, and its elegant outline gives the impression of lightness and airiness of yogurt. yogurt with caramel + crunch from almonds, hazelnuts in caramel and seeds. The tastes themselves suggest that this is not standard muesli, dominated by oatmeal, but an extraordinarily tasty supplement with a variety of mouth-watering ingredients. To demonstrate the composition of each product, we chose the top view or “top view” technique, often used on Instagram for food photography. This technique favorably highlights all the delicious components of crunch. The diagonal and layering provide a clear understanding of what constitutes a product and the proportions of crunch and yogurt, allowing you to simultaneously show the variety of ingredients and the process of combination. 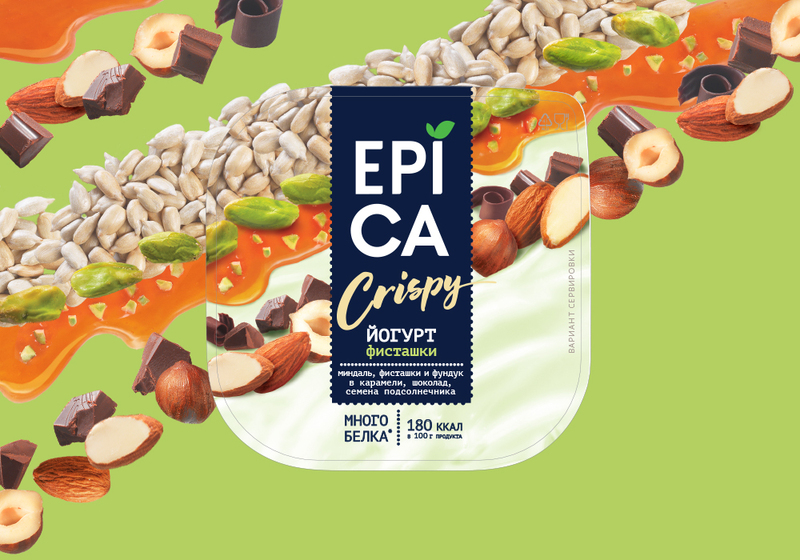 And like all Epica products, it all looks so delicious that you immediately want to try. 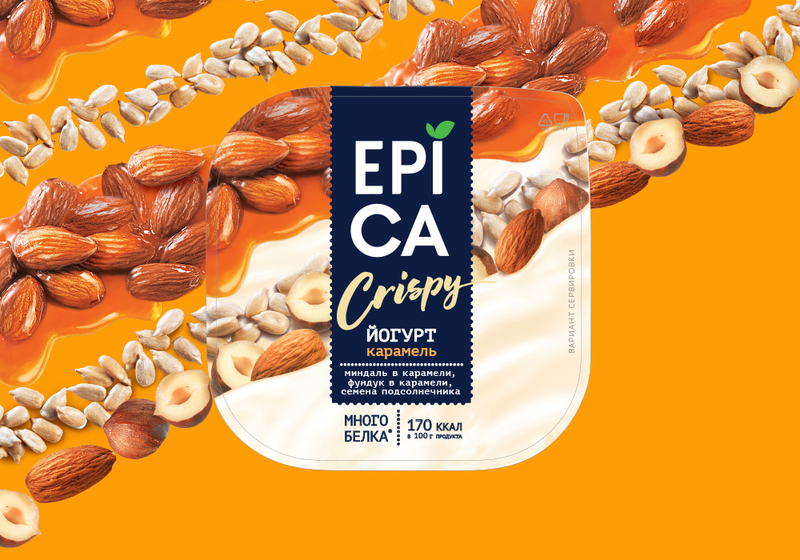 Epica Crispy is a natural and nutritious granola yoghurt to maintain vitality with unique flavors, all of which are worth trying.